The story of Joan of Arc has been immortalized in artwork, literature, film, and as you have discovered this season with Odyssey Opera’s #TrialByFire season, music. We are excited to present Jeanne d’Arc au bûcher (Joan of Arc at the Stake), Arthur Honegger’s dramatic oratorio about the beloved French heroine. This particular depiction of Joan has seen some brilliant women take on the challenge of portraying such an important historical figure, including the commissioner of the piece, Ida Rubinstein, actress Ingrid Bergman, and most recently Marion Cotillard. Acclaimed actor and dancer Shura Baryshnikov can now be added to the list of strong and inspiring women cast to portray this extraordinary young woman. When Odyssey Opera presents a fully-staged production in a traditional proscenium theater, as you will enjoy in April when we mount Verdi’s Giovanna d’Arco, there are established audience expectations of such an experience: the stage and its fourth wall contain the action; costumes, scenery and set pieces establish time and place of the story; and the audience is separated from it all by an orchestral moat. With our semi-staged productions, we can creatively use the entire space to give our audience an immersive experience that they might not expect. 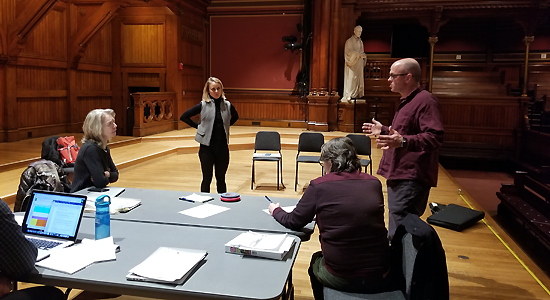 Last week, the production team joined Artistic and General Director Gil Rose and Shura Baryshnikov on a walkthrough of Sanders Theatre. As the group assembled, there was an energy in the room and an unmistakable, evident excitement as questions about presenting this Joan of Arc story were posed. Is Joan always on stage? Does she join the audience and witness the events happening around her with them? How much movement space do we want and need? Do we want a square-shaped movement space, or would a triangle be more powerful? How does this help us with sightlines? Two more questions here? Gil and Shura took their time exploring the space, considering the layout of the stage (which will be filled with a full orchestra and most of the chorus), contemplating the audience, evaluating the space as a whole, and discussing the function of Sanders Theatre as an integral part of the performance experience. There were also more practical questions that came up such as discussion of the floor of the stage. In professional dance productions, it is common practice to install a floor covering called marley. Given that Shura is a dancer, the team deliberated using this flooring for the performance. Shura appreciated the thought, however, as she walked around on the stage she commented how much she loved the wooden floor and thought the wood provided a more truthful experience for Joan.